If there is any way I can help that would be great. we have just 25 hours each year , fort "arts plastiques " .. I spent half an to show the basic , and it was not very funny ..
good the problem it is that there is the barbamama 's childrens are seventh !! I forgot one girl more! May I ask do you animate them your self or does Alain? well .........as I said , I made 2 groups for each class ..
so ..to see each shape , one after one ...... and to get the EXAMINE mode . they are so used to look at things as images !! Very sorry for my delay getting back to you Alain, bumpy came down for the weekend and I have let my spam build up again in my emails and I have not planted anything in the garden yet but I am now very happy with some of the new ideas I have been experimenting with such as BezierPatches, NURBS and more recently polygon subdivision. Yes I have allowed my self to get sidetracked with new ideas yet again but I am very glad I have because seamless will be easier than ever in a shorter time to make sophisticated animated models as a result. I developed a lot of new nodes (and improved a number of older nodes) but perhaps most of the work I have done for the last few months is already obsolete before I had a chance to demonstrate them. This feels a little sad but this obsolescence of some older techniques means I have found better ways so I am more happy than sad. How much time did your student have last year on seamless? I was very impressed with some of the animations they made. I looked at all of the new wrls before I went to sleep last night and was stimulated by all the different shapes made. I can see some look very creative in deed. 4 normal classes ( 27 pupils in each ) , an that year 2007-2008 , I let them 2 hours with seamless ..
some artists used that question , look at Bernard Pras et Tim Noble here , when you will have time .. 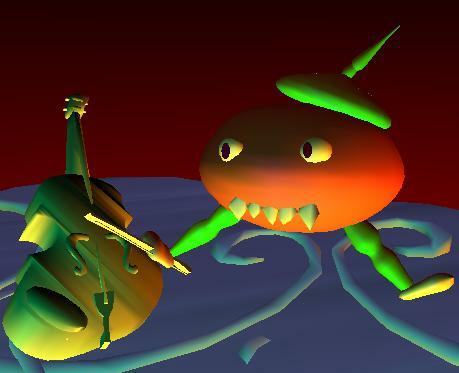 I told her that I use that way to anim each part ..
hello Alain, Thyme would have to put the Alain pumpkin to you:)..
output IE of seamless does not show me animation! normal? so i make one hours for understand why? is what that comes from my IE? it seems to to me that Alain it is ok... ? 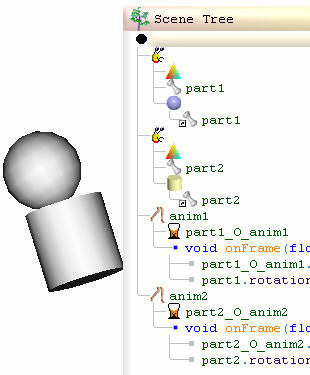 The short answer is its fine to use only one Anim node to animate everything and this protects against problems that can arise if we do not pay attention to which anim node is selected when we are animating a part. 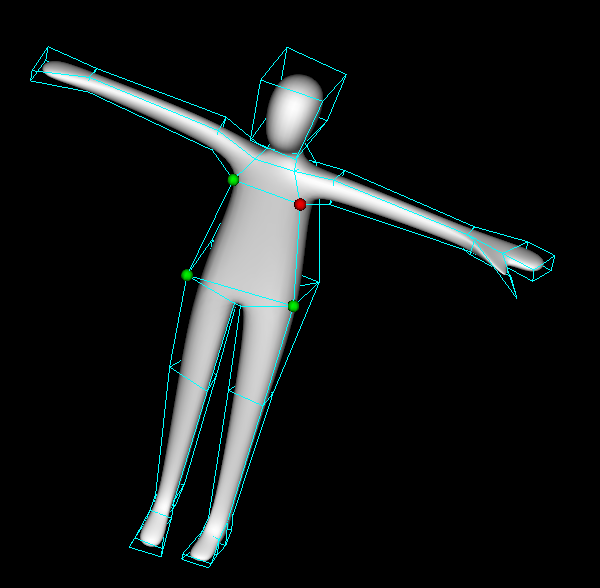 I would at least use only one anim node for all of the parts contained in a Seamless node for a gesture but I wonder if were asking for each Seamless node rather than each Part node? You can have only one anim node to animate multiple Seamless nodes too or you can have one anim node for each Seamless node like you show here Alain. The advantage of using only one anim node per file to animate everything in the file is: we can avoid the problem of accidentally making 2 anim nodes animate the same parts at the same point in time. It is very easy to make this mistake now that seamless automatically adds script for the selected anim node when ever we pose our model. To use an ugly analogy: a slave has a problem if he has more than one master telling him where to go at the same time. However if we want more than one gesture or if we want one anim node to play for a different period to another we will have to use more than one anim node per file. Also we may prefer to use one anim node per seamless node to keep each seamless node independent from each other. This can make importing and exporting animated models much easier. This is all logical but it can get confusing so If you are confused by any of this please let me know so that I can elaborate or use different words. the avi we get has a codec ......ppl needs to install Fraps to read the avi !! Yes so many programs but so few offering a solution to what I would have imagined was not much of an ask. Creating the still pictures (the frames) is not the challenge for me though because povray will do this task better than any real time video card. Same as you Alain, having the wrong codecs has been one of the big problems I have faced when trying out various video programs. I thought the only real challenge for me was joining the frames but now I realise I need this and I need to be able to add sound too to make a movie. 2.123 has 6 new nodes designed for the purpose of creating high quality sound tracks. 2.123 has had a number of bugs fixed and also a number of improvements have been made. I have made it so seamless can output a POV-Ray movie for an Anim node by right clicking on the Anim node in the scene tree. For well over a decade I have wanted to make a 3d animated move using povray and now with the popularity of 3d animated movies featuring in you tube I see a great opportunity. 2.123 completes my 4th priority for the year by adding a set of Bezier nodes to match the Elliptical set. Months ago I would have expected the main focus for this version to be on these new Bezier nodes, however, although these new Bezier nodes make seamless easier than ever before to create smooth high quality avatars, there is doubt about the future of these nodes because of yet newer nodes being developed that may be even simpler to use. Since 2.122 I have played about with Bezier Patches which seemed like a logical evolutionary step for Seamless and progressed onto Rational Bezier Patches and NURBS and then Polygon Subdivision. I really wanted to write a demo this year to show how to make an avatar using seamless build nodes but I feel now more time is needed to test out the new methods. I do like the concept !!! but the ouput povray movie works very well !!!!!! The seamless synthesizer can be broken down to very simple components so if I ask a few questions I should be able to help. My first question is do you hear any sound at all (in the output wav file) after adding a HarmonicPatch to an Oscillator? I opened an old smls file , witch was animated .. I got an avi file ! I was very happy ! same with the animtete.smls I used before .. So I am very lost now .. I see you generated a wav file Alain and slid the pitch this is success! But I must clear something up about the sound track nodes. They are only designed for creating a wav file (for a sound track in a movie or just for an mp3 or possibly you can use the wav file after it is generated in a vrml file). It is important to understand you can not output any of the new sound track nodes to anything other than a wav file. 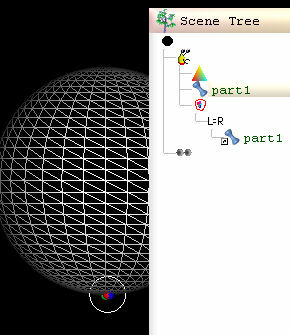 Think of the Composition node as a node that replaces the Scene node for making sounds instead of making shapes. Only use the Composition node's output button when making a sound track. It wont do any harm if you accidentally click the Scene node's output button but the wrl will be of no use to us so just delete it. Blink is still needed to mix the wav file into the movie file.